The highland forest area of Chiang Mai province hosts a major watershed area alongside many ethnic communities, whose populations are highly dependent on water for their livelihood. Water shortages, drastic economic activity development, pesticide use, and littering in this watershed area are increasingly threatening the livelihoods of these ethnic communities and contribute to forest, soil, and water quality degradation in the area. Groups that are especially vulnerable to these threats include women, elders, persons with disabilities, and the youth. Local youth, including boys and girls are key actors in their communities as they are the future voice and decision makers. As a result, this project focuses on engaging local youth at an early stage in sustainable and responsible natural resource management practices as a basis for creating positive and sustainable change in their communities. Through the integration of an adapted version of the Swarovski Waterschool Curriculum into local school curriculums, this project aims to raise awareness of the boys and girls on the immediate issues and negative impacts on contaminated water, as well as increase their capacities and knowledge on water as a key natural resource for the livelihood of their communities. 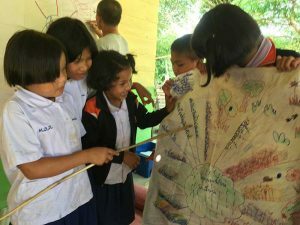 Moreover, the Swarovski Waterschool Programme will help to provide local youth with the right tools to empower them to bring positive change and take action in raising awareness on water issues in their communities to other local community members through a student research component of the curriculum. As part of achieving these goals, the capacity of the local school teachers will also be developed in order for them to fully understand and implement the curriculum into their classrooms.